Chateau / Country House1130 sq. ft.
You will not find a better view in the Lucca area than from the terrace here! DISTANCES: Lucca km. 8 - Florence km. 78 - Pisa km. 28 - Versilia beaches km.28. 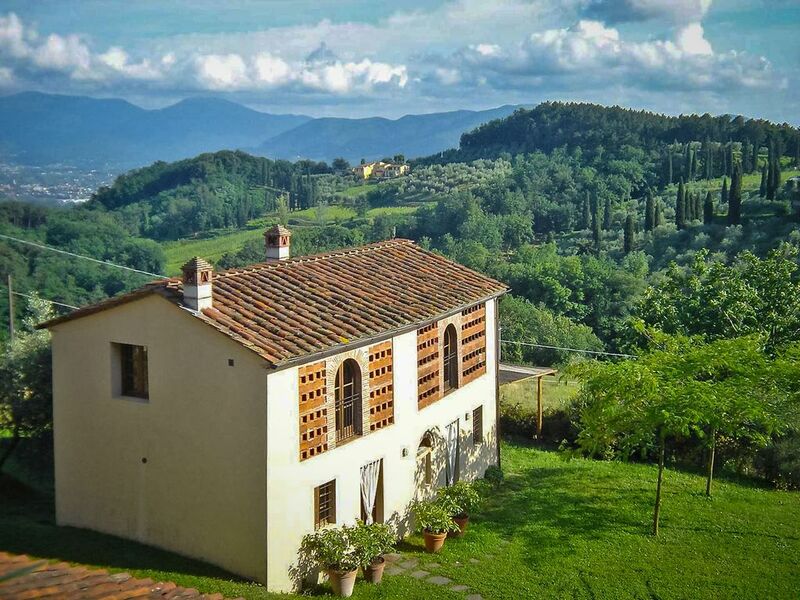 Completely detached house with a wonderful view over Lucca and the surroundings. Good restaurant within a short distance. This charming, completely detached country house has the most gorgeous location, situated a little way up a hill with a spectacular view of the Tuscan countryside at its most beautiful; vineyards, olive trees, characteristic stone houses with Lucca itself and the intact city wall in the background. It is most captivating. Because of its unspoiled landscape, the area, "Pieve Santo Stefano" is one of the most desirable area around Lucca. Here one feels at peace with nature yet one is close to the city with all its modern conveniences. Additionally there is a good country inn within short distance. Agli Orti belongs to a manor house dating from the 15th century located 50 meters up the opposite hill, across a country road. This villa is surrounded by a beautiful and well maintained garden as well as a fantastic view. Here, in the middle of the park is a recessed round swimming pool with a diameters of 10 mt, a depth of 1,40 mt. There is a poolside area with table and chairs. The pool is shared with the owner. Children in or around the pool must be under adult supervision at all times. The main floor has a large, well-lit living room with a characteristic stove. It also has a large bay window that faces the panoramic view, and a TV. The characteristic brick kitchen is of good quality and has an oven, refrigerator, freezer, grill and dishwasher. In a small storage room is the washing machine. Bathroom with shower. On the second floor is a double bedroom with bathroom en-suite (shower), two twin bedrooms with a shared bathroom with shower. The view from the second floor is even more impressive! The house is furnished in Tuscan style with terracotta floors and beamed ceilings. In front of the house there is a covered area with deck furniture and barbecue. From here there is a view toward the valley and Lucca. Internet WiFi gratis, private parking inside the property. OTHER: a good restaurant within 1,5 km - Supermarket and other small shops in the village of S. Alessio - ca. 4,5 km.